I asked nutrition researchers this question, and they all pointed out that the sugar in fruit juice is more concentrated than it is in whole fruits. 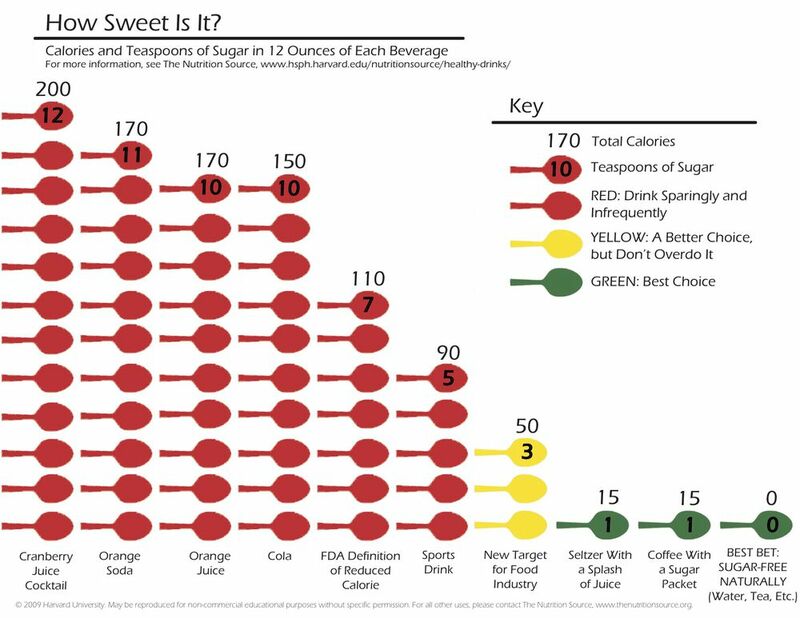 When you drink fruit juice, you get a mega dose of sugar the same way you do when you drink soda. “Juices have some nutritional value when the sugars are not added. But people don’t drink all that much [natural fruit] juice — it’s too expensive. They drink juice drinks with added sugars,” said Nestle. These juices drinks — like bottled cranberry or grape juices — are basically sugar water with artificial flavors and little nutritional benefit. And even pure fruit juices that deliver vitamins and nutrients — like freshly squeezed orange juice — also deliver a lot of calories and sugar. A handful of countries are moving to tax sugary drinks in an effort to fight obesity. But in some instances, the taxes continue to focus on soda, and overlook the huge quantities of sugar people are consuming in fruit juice. In Britain, for example, the government just announced a forthcoming sugary drinks tax — but it only applies to soft drinks with added sugar, and excludes all milk-based beverages and fruit juices. (See the Treasury Department’s fact sheet on the soda tax). That means beverages like milkshakes and cranberry juices won’t be taxed even though they’re nearly as damaging to health from a nutrition standpoint. Berkeley, California, has a tax on sugary drinks, but it also excludes energy drinks, sweetened milk products, and 100 percent juices. Soda companies in the UK are considering legal action over the tax on the basis of discrimination, since the tax excludes other sugary drinks.